Unionville Milliken Soccer Club (UMSC) is pleased to announce the signing of Sanford Carabin as the UMSC League1 Ontario Mens Head Coach for the 2019 season. 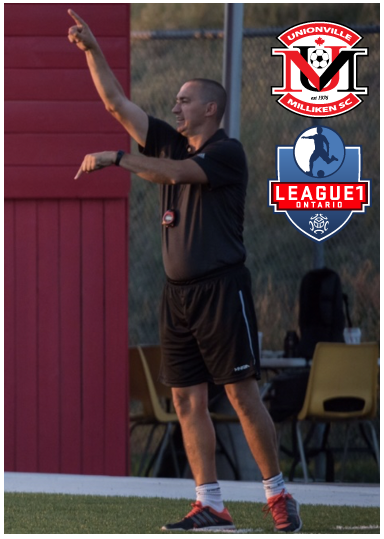 Coach Carabin is well known within League1 Ontario (L10M) and has coached teames since its inception in 2014 with Durham United (2014-2017) and Darby FC (2018). During this time, he has helped develop a winning record with every team and launched the professional careers of L10 players, as well as, provided opportunities for a further 15 players to go on to play NCAA, U Sports and OCAA soccer on scholarship. He was named the East Team Coach in the Men’s L10 All-Star game in 2016. Carabin is currently the Technical Director of Durham Region Soccer Association focusing day to day on developing the game of soccer within the Durham Region. He also serves as Performance Analyst for the Jamaican Women’s National Team that has recently made history by being the first Caribbean Country to qualify for the Women’s World Cup (France 2019). Previously, Carabin coached at Seneca College where he served as Head Coach of the Men’s program from 2014-2018 and also served as an assistant on the Centennial College Men’s team (2013). At the Youth level, Carabin has held Technical Director positions at several Clubs/Academies including: Brampton Youth SC (2014-2016); Bryst Academy (2011-13); Markham SC (2006-2011). Carabin is currently completing his Union of European Football Associations (UEFA) A coaching license having previously obtained his USSF A licence (2013), UEFA B License (2012); USSF B (2012) and Canadian National B License (2007). We are pleased to have Sanford join our L10M coaching staff and look forward to an amazing season.